The Silk sarees nearly 2500 BC year old technology continued in few part of India. The Silk products as Sarees, Dhotis, Salvar, Kurtha, and others keep it demand, attraction, and royalty in its look. In-spite of modern world still Silk keeps high demand, status symbol, and Fashion of the Era. There are many evidences from Archaeological researcher the silk used during 2400 BC at Chanhudaro and Harappa culture in ancient India and there are evidences silk also produced in China during that period. The silk threads produced through sericulture of Silkworm species with the process of degumming and reeling. There are different weaving method and technology used in creating a valuable, marvelous Silk Sarees in different part India. • Simple and Splendor Kanchipuram Silk sarees is very famous for its handloom work with Golden Zari. 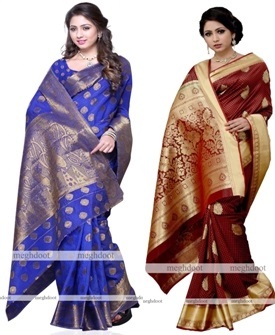 The specialty of the silk saree is made of pure Mulberry silk threads. The body colour and the border of the Kanchipuram silk saree is different contrast colour designed with Zari, which comes from Gujarat. The Pallu or the hanging end of the Kanchipuram saree made separately with the same colour silk threads. The Main saree and Border of the Kanchipuram saree made separately. All three interlocked together so precisely that no one can find out. The Zari design work is very special like a bird, elephant, and God and goddess images or according to the customer choice. The Contrast Borders, different colours, designs, the quality of Silk and the Zari thread used, and finally the artisanship keeps Kachipuram Silk Sarees in High quality and value at international level. The contrast colour, the artistic Pallu, quality, and design of Zari keeps every female more attractive even with fewer jewels. This is one of the main reasons, most of the South Indians prefer to get at least one Kanchipuram Silk wedding Saree according to their financial conditions. The Kanchipuram Silk saree got the Geographical Indication by Government of India. • The Royal Touch with Mughal Design Banarasi or Benares Sarees originated from Varanasi of Uttar Pradesh, India. The quality of the Zari threads gold and silver keeps the high value of the Banaras Silk Sarees. The Banaras silk sarees made out of the fine quality of silk threads and rich work Pallu and designer work on entire body portion makes little bit heavier, still it is a must saree for the wedding in many parts of India. The special characteristics of Mughal style, intertwining floral designs, the mixer of Silver and Gold threads gives a visual effect and Royal Touch to the Banaras Saree. • The specialty of the Sambhalpuri Silk Sarees never fades for years together. The Silk threads process with natural colour and not chemical used to dye the fibers. The Dyeing process will take minimum 5 weeks and the saree weaved to the taste. The attractive designs like Conch Shell, Flower Motifs, Fish, or animals keeps the Saree rich, elegant and natural pleasing look. The variety of Sambhalpuri Silk saree comes in different budget range, mild natural colours, every Teenage girl Say No to Saree but Yes to Sambhalpuri Silk Sarees. It is the pride of Odisha. Any Indian girl, never says no to Silk sarees, whether it Kanchipuram, Sambhalpuri, Mysore or Patola Gujarat type Silk sarees, Chanderi Silk sarees of Madhya Pradesh. Be Indian and Buy Indian and spread the Indian culture.